Wristbands have come a long way since they first became trendy a decade or so ago. Silicone wristbands are now used for a variety of purposes. For example, for business, for a cause, and event bracelets are all very versatile and popular. Custom Wristbands for business are popular for many different uses. Promotional bands can be used to market to a new audience, launch a product in a new market, or promote the release of a new website. Businesses love bracelets because they are cheaper and easier to distribute than other bulky promotional items. When a bracelet is used to promote a trendy and popular product, the wristbands become a trend all their own! Wristbands are widely used to support different important causes. Wristbands for causes often use the color or colors associated with that cause. For example, pink wristbands support breast cancer, red wristbands support AIDS awareness, and red-white-and-blue bracelets support patriotism. Customized bands for a cause with a specific color, as well as a personalized message, make it very popular. 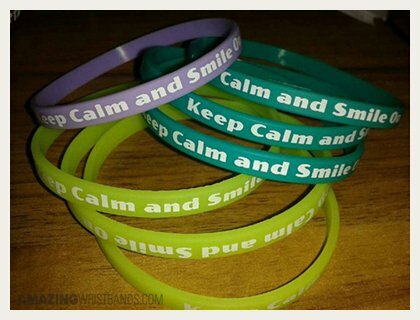 Groups use bracelets for a cause to promote events, increase awareness, and raise money. Event organizers love using bracelets for their events. These can be used for admission into events, grouping people within events, or promoting the event ahead of time. When event bracelets have the event's details on them, such as the name and date of the event, people will wear them long after the event as a memento. Instead of standard size wristbands, order slap bands that snap to your wrist and fit snugly in place. Any kind of wristbands can be created quickly online and delivered within a week. When purchasing for your business, cause, or event, be sure to make sure you buy only 100% silicone wristbands. Create your custom bracelets today at AmazingWristbands.com.